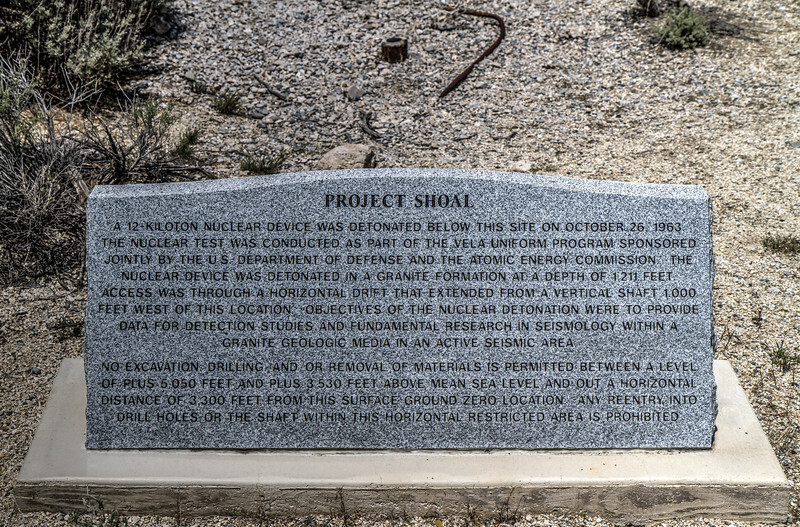 001 Project Shoal - A 12 kiloton nuclear device was detonated below this site October 26, 1963. The nuclear test was conducted as part of the Vela Uniform Program sponsored jointly by the US Department of Defense and the Atomic Energy Commission. The nuclear device was detonated in a granite formation at a depth of 1,211 feet. Access was through a horizontal drift that extended from a vertical shaft 1,000 feet west of this location. Objectives of the nuclear detonation were to provide data for detection studies and fundamental research in seismology within a granite geologic media in an active seismic area. No excavation drilling and/or removal of materials is permitted between a level of plus 5,050 feet and plus 3,530 feet above mean sea level and out a horizontal distance of 3,300 feet from this surface ground zero location. Any reentry into drill holes or the shaft within this horizontal restricted area is prohibited.